Ruth writes: It was a great start. 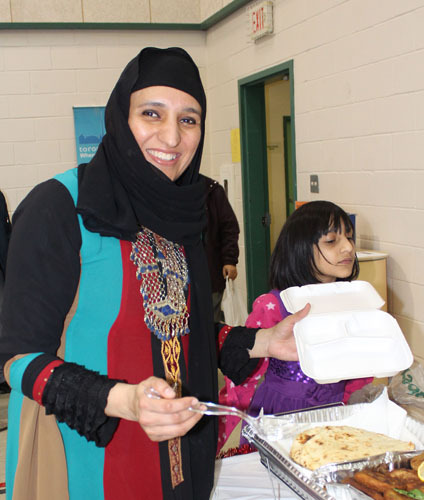 Last weekend was the first Family Food Day presented by the Understanding Islam Academy and MuslimFest. It was very well organized. All the booths were well labelled as were most of the dishes. As usual, we arrived just when the festival was due to open. Parking was easy. Only a few patrons were there. My friend Romaine and I had a pleasant, leisurely time talking with Maryam, Project Manager of the Academy, and people at almost all the 14 vendor booths. 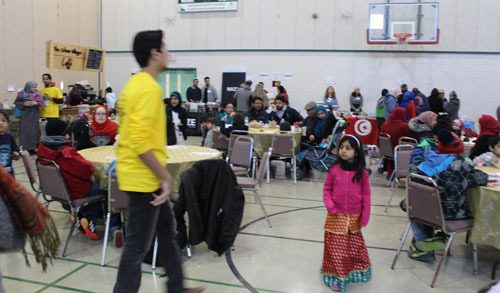 By the time we left 2 1/2 hours later, the large gymnasium at the Islamic Centre of Canada (ISNA) was getting packed with families. We started out touring the booths to see what was available. We were trying to decide what to eat for lunch and what to take home for dinner. The variety was amazing. 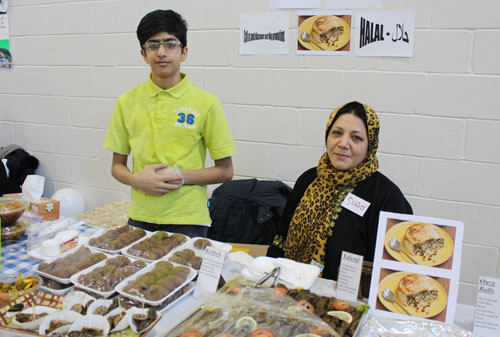 There was Suad and her son selling Iraqi and Arabian Gulf food. They were the first to give us free samples. I couldn’t resist and bought Ouzy chicken balls, Valenji (stuffed grape leaves), Kebbeh (minced chicken buns with cracked wheat and at least six spices). They had boxes so we could buy food to take home. Some of the vendors represented restaurants. Most were from home kitchens. I decided I wanted to stick with the home cooking. 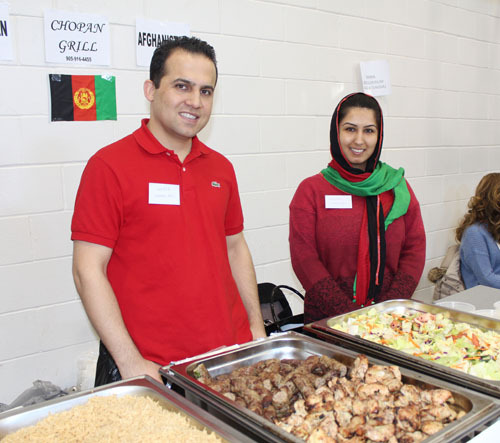 I took brochures so I could try the restaurants like the Chopin Grill (“The Authentic Taste of Afghanistan”) later even though Nasir (left) & Nosheen were very friendly. At another booth, I found Portuguese cod fish and egg tarts. 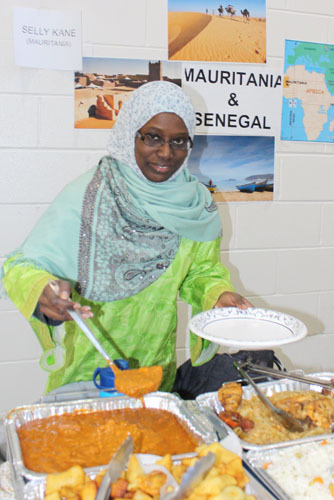 Selly Kane had dishes from Mauritania & Senegal. Those are adjacent countries in west Africa. I wanted to go back to her later, but by the time we finished our tour, it was too late. There were too many other dishes I could not resist buying. Food came from the Calzone Hut & BBQ, a restaurant in Mississauga, and I learned that Calzone was a pizza style from Naples, but I didn’t want to fill up on pizza. 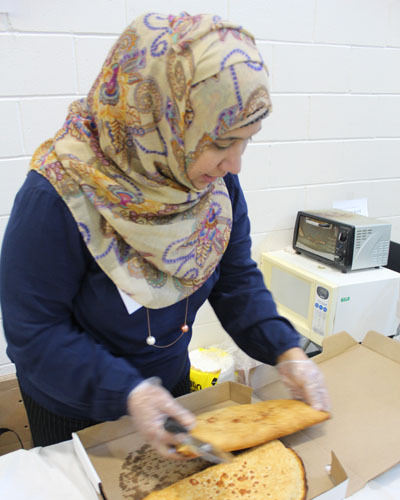 There was Baklava from Syria that looked wonderful because it wasn’t all syrupy and sticky. And Momos and Eclairs from Nepal. But I wanted to try something new to me. 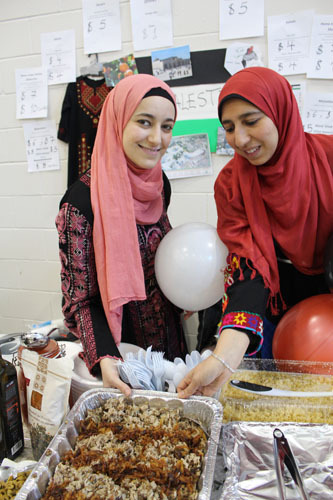 At the Palestinian booth was beautifully presented Mujadara with rows of rice, onions, and lentils. It looked very appetizing. I bought a small dish to sample. It was so delicious, I bought some to eat later at home. The desserts would have taken up too much room in my stomach. The Tunisian Coucous casserole looked great, but I didn’t want to buy the whole thing without sampling. I will try it the next time I’m in a Tunisian restaurant. I think it was Nabila from the Pakistan province of Khyber Pakhtunkhwa who sold me the most food – more than I really needed. I had just finished reading Malalai Joya’s book “A Woman among Warlords” so my thoughts were in that part of the world. The book is about Joya’s courageous struggle to reform Afghanistan and improve the lot of women there. While Nabila was from neighbouring Pakistan, her sign made me think of Peshawar and the Khyber Pass which I had once visited. She was also trying to answer my questions while setting up her booth and managing her lively children. Her food turned out to be perfectly spiced for me and my family. It was such fun sampling, buying and learning about food that we are looking forward already to next year. 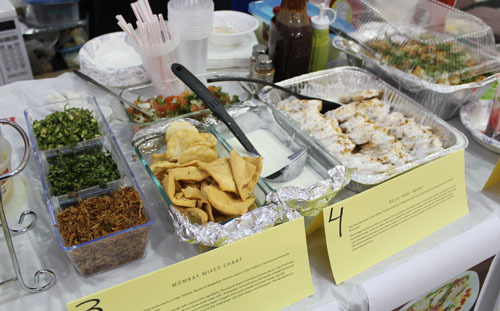 Several other cultural groups also have food fairs. You might remember my blogs about the Goans, the Burmese and so many others. Then there’s the Sikh’s Khalsa Day banquet usually in Nathan Phillips Square. We are so fortunate to have all these choices here in Toronto and such an opportunity to meet our neighbours. Keep following us on Twitter at #torontomulticul for such upcoming events. 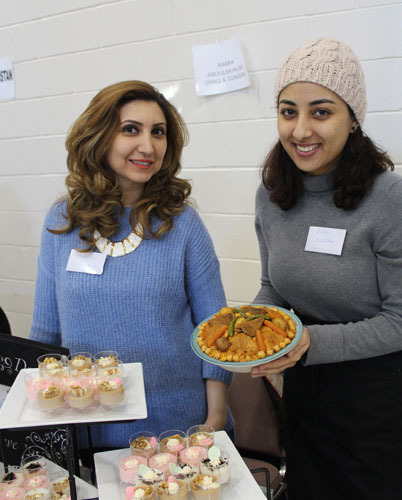 Nice coverage Ruth, I am happy that people came despite the extreme weather and the Calligrapher and Nasheed artist added more charm to the purely foodie event! It was nice to see my Dahi baras in the first picture and my six year old in the red gown, it was a warm gathering on a cold day and you did a great job! Glad you liked the blog. It was a lovely event and the children’s costumes added to the colour. Ruth.